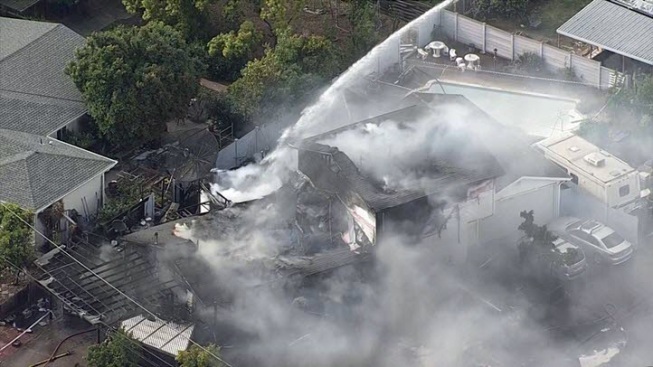 A two-story house in Cupertino sustained $1 million in damage Thursday afternoon in a two-alarm house fire that firefighters were still working to extinguish into the evening, Santa Clara County fire officials said. The fire was reported just before 4 p.m. in the 10000 block of Flora Vista Avenue, near Garden Gate Elementary School. Flora Vista Avenue remained closed Thursday evening between Gardena and Greenleaf drives. About 40 firefighters responded in five engines and two trucks. One Hazmat unit, two rescue units and three chief officers along with personnel from the Santa Clara County Sheriff's Office also responded, according to fire officials. Responding crews saw smoke en route to the fire and reported very windy conditions. No injuries have been reported. At 5:30 p.m., fire officials reported that a family dog was missing.